Everytime, I listen the music from UMWELT, it makes me think of an hypothetical soundtrack for a new “MAD MAX” film… The sound is dark and committed with no hope in the future world but keep movin’ like Max. 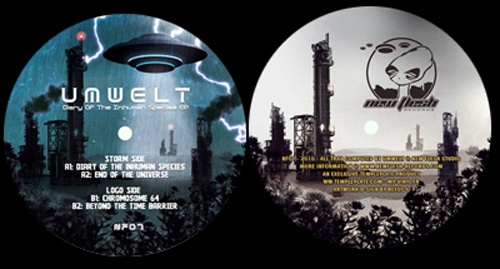 These days, if the bass is like the petrol…UMWELT is never short! So a couple day ago, Freddy J a.k.a UMWELT has released a new E.P entitled “Diary Of The Inhuman Species” on NewFlesh Records. At the same time, on the NEW FLESH LAB (The Sub-label focus on ambient & dark music), JAUZAS THE SHINING releases a new vinyl titled “Bad Cave / Insomnie”.